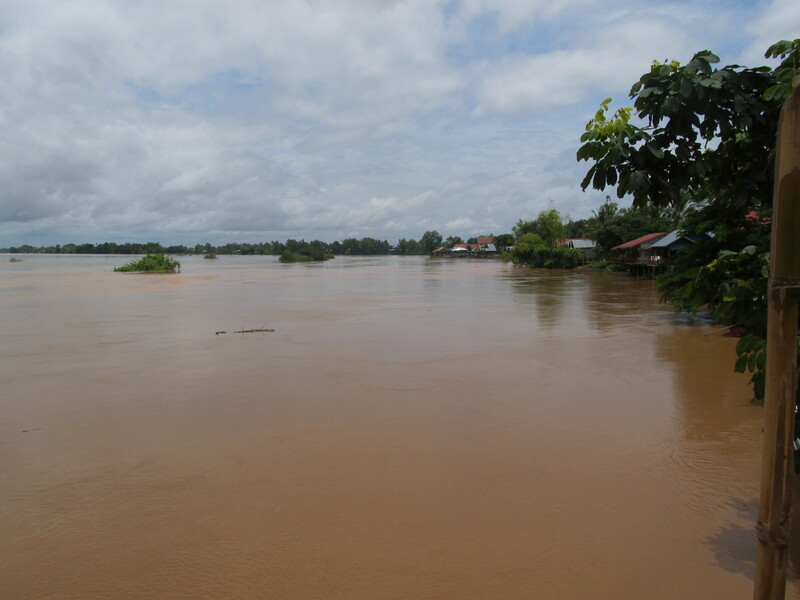 Our journey began on a tiny longboat, skimming up the Mekong River to the gloriously-named 4000 Islands. A pile of precious backpacks balanced precariously on the prow, and I half expected to see mine tumbling into the brown water at any moment. Luckily, this concern did not become a reality and we made it to the shores of Don Det safe and dry. We began the necessary enquiries to find decent lodgings for the night, eventually choosing a little bungalow on the other side of the island which had the luxury of a hot water shower yet was within our budget. Having been on the road since that morning and travelling all the way from Cambodia, our first priority was a shower before exploring the island. The exploration was not lengthy; the island is tiny and consists of a couple of dirt tracks populated with restaurants, internet cafes and bungalows. Feeling pretty knackered and in want of a chilled afternoon, we found a bar and got settled for the afternoon. The Reggae Bar was probably the best joint on the island (incidentally, joints could be purchased at a reasonable price there). Here we had found a meeting place for hippies of all nationalities. Chilling in hammocks overlooking the murky Mekong, we quaffed beer and quietly read our books for the next few hours. The ‘streets’ of Don Det. The next two days we spent on Don Det followed much the same pattern. A questionable breakfast from a menu written in extremely dubious English, then a little wander before settling in a bar for the day with our books and a pack of cards, maxing relaxing. There are ways to be more active in Don Det – you can hire bikes and kayaks or take a boat to the other islands. Kim and I, however, were happy to chill on this little island and just ‘be’. Our next stop on the way north was Vang Vieng, the home of ‘tubing’. If you aren’t aware of this travelling phenomenon, it involves hiring an inner tube and floating down the Nam Song river, hitting the bars that line the shores along the way. Tubing is famous due to the amount of deaths and injuries that occur here every year. Combine young travellers with copious amounts of drugs and alcohol, add a fast-flowing river plus various rope swings and other hazards – what do you think is going to happen? 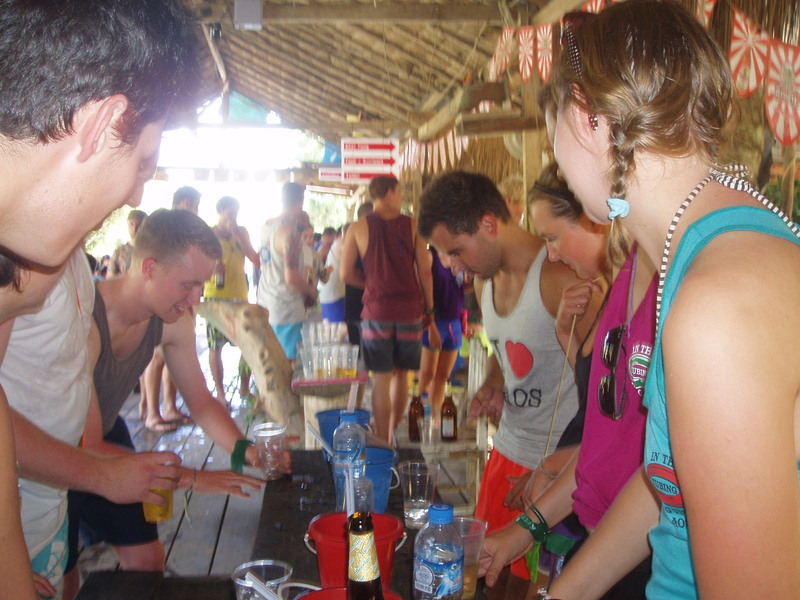 By the time I got to Vang Vieng the authorities had got involved and a lot of the bars had been closed down. There had also been a massive crack down on drugs and I encountered a much tamer version of the legendary epitome of hedonism. One of the tubing bars, Vang Vieng. That’s not to say I didn’t have a crazy time in that town, though. I should point out that Vang Vieng is actually a very beautiful place surrounded by gorgeous mountains and picturesque scenery. Unfortunately, since the focus is on getting wild here most of the visitors are too drunk to appreciate this. There is a strange obsession with the TV show Friends in Vang Vieng; it’s on repeat in nearly every bar and restaurant for some reason. Anyway, we arrived in the town and sorted out our digs, then had a fairly quiet night in anticipation of the carnage that was sure to be unleashed the following day. After a decent breakfast and having donned our ‘In The Tubing’ vests which are something of a uniform in Vang Vieng, we set off to the river to find out what it was all about. The hours that followed become a blur of drinking games (beer-pong and flip-cup), talking to random people and thinking that this wasn’t as crazy as I anticipated… Things got unstuck when I became separated from my friends and had to make some new ones pronto. Despite us only seeing the tamer side of tubing, that was still the most unexpected night I experienced in Asia and there’s no way I’ll ever forget it! Two days of tubing was enough for us, and Kim and I were more than ready to move on to the town of Luang Prabang for a bit of culture and, hopefully, some trekking. The journey north was rough for me as I was feeling very ill that morning – possibly due to my diet being 90% baguettes in Laos up to this point. It was one of those trips you feel lucky to walk out of alive when you reach your destination. The road winds dizzily through the mountains and there is evidence of landslides everywhere. I couldn’t help remembering something I learned in A Level Geography – that landslides cause more deaths than any other natural hazard. I thought it best not to mention this fact to Kim. At one point on the journey the bus had to stop for an hour whilst a recent landslide was cleared from the road. It was simultaneously the most stunningly beautiful yet terrifying drive I have ever taken. Up in the clouds on the way to Luang Prabang. 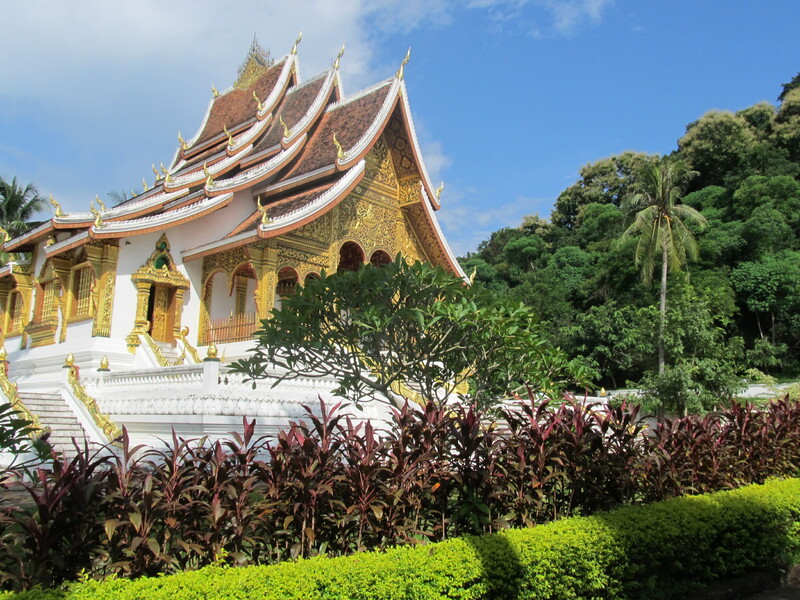 Luang Prabang turned out to be worth the risk. It is a lovely town, a UNESCO World Heritage site and therefore well-looked after. There are numerous great cafes and restaurants, plus a fabulous night market. That’s alongside the colourful monasteries and the interesting Royal Palace, too. Our first couple of days in the town were spent exploring, drinking tea by the river and shopping. We spent a fun afternoon in the Royal Palace, which has some unexpected exhibitions such as a room full of gifts sent to the Laos royal family from nations around the world. One morning we jumped in a tuk-tuk to visit a nearby waterfall and adjoining bear sanctuary. Swimming in the cool fresh water surrounded by jungle was a treat this far inland. On our last day in Luang Prabang we cheekily paid to use the outdoor pool at a 5* hotel, and pretty much had it to ourselves all day (bar a few kittens playing in the sunshine). Royal Palace temple, Luang Prabang. 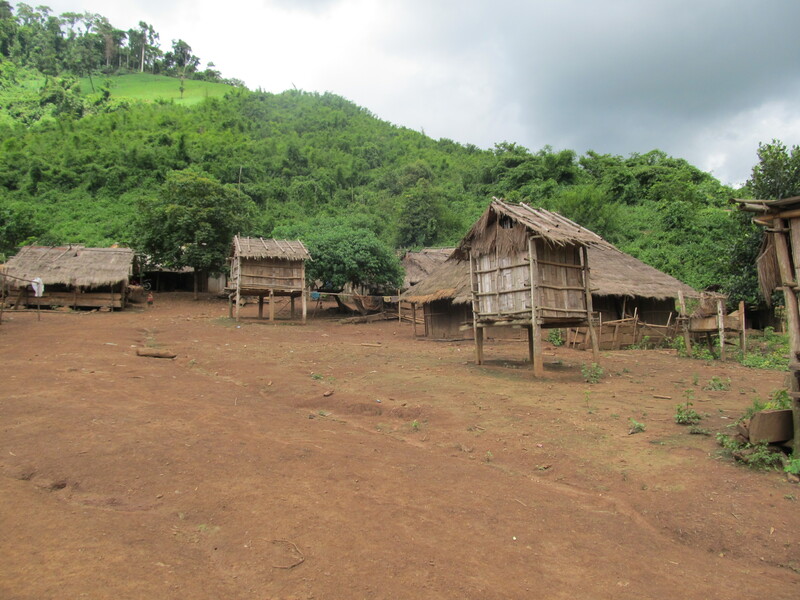 Whilst in the north of Laos we embarked on a two-day trek to the mountains and visited hill tribes. 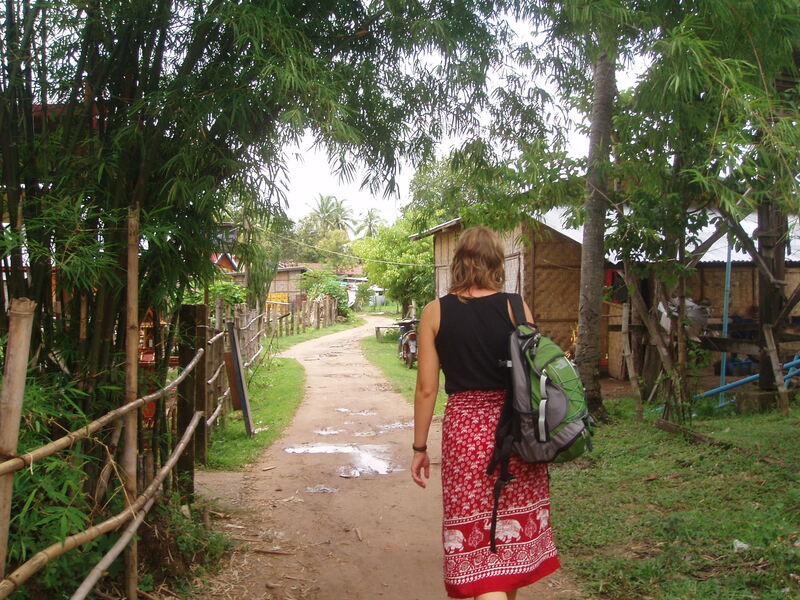 We set out in the early morning after a fantastic local breakfast of sticky rice and fruit. It was just Kim and I and our guide walking through the fields, steadily climbing all the time. Kim got off to a rough start when she slipped on some mud and ended up ankle deep in a puddle within the first 30 minutes. Little did we know what was to come later in the day, though. There had been an unseasonable amount of rain that month, so the river was swollen and we soon had an obstacle in our path. 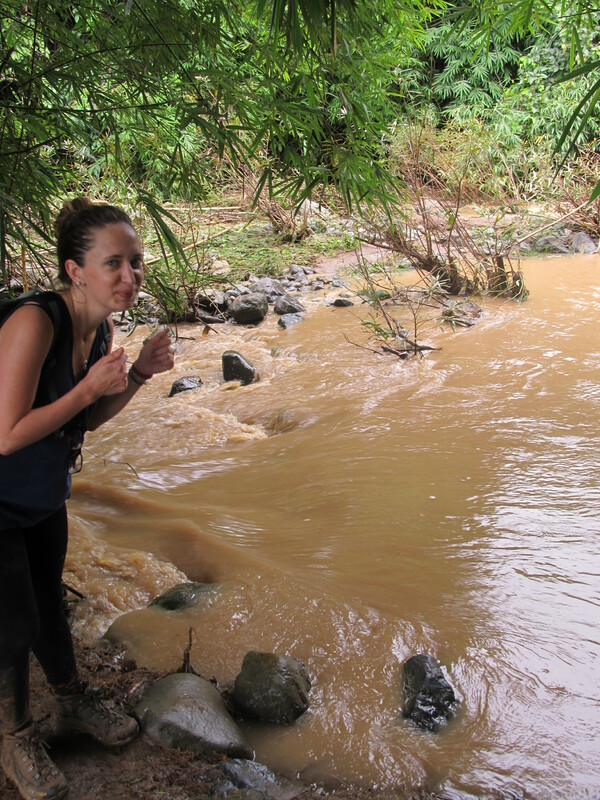 What was supposed to be an easily cross-able stream was now a knee-deep tributary of brown water. We turned to our guide and asked what we should do. “Up to you”, he replied. Great, so here we were at the start of our exciting trek and we had to decide whether we were prepared to start wading through rivers or call it a day and give up. Kim and I being persevering types, we agreed to wade across and hoped this was a one-time thing. The guide kindly fashioned us a couple of walking sticks out of bamboo and off we set, gritting our teeth as the sandy river seeped into our walking boots and trousers. The bottom was extremely rocky and it was hard to find solid footing due to the strength of the current. Still, we made it across and carried on up the mountain. This experience was repeated a further 15 times before we reached our bed for the night. After a while we just didn’t care anymore, but there was still the danger that one of us would trip and fall over at any time. Kim being on the shorter side, at times the water was up to her hips which made getting across really hard-going. Things weren’t improved when – after our guide adamantly proclaimed there were no snakes up here – we saw a huge black snake on the opposite river bank as we set out to get across. We’d empty our boots out of all the river sediment after every couple of crossings and continue on, trying to suppress our English instinct to moan. 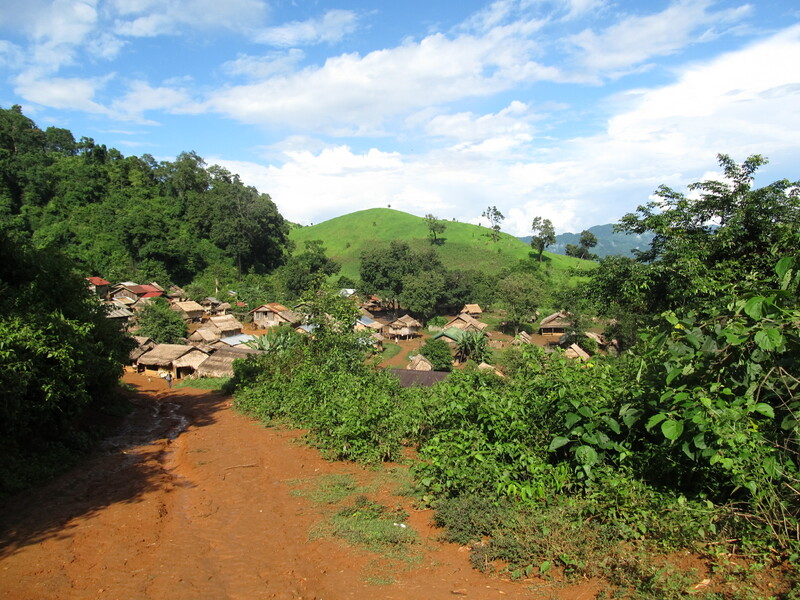 Hmong village, northern Laos (note the gathering rain clouds). 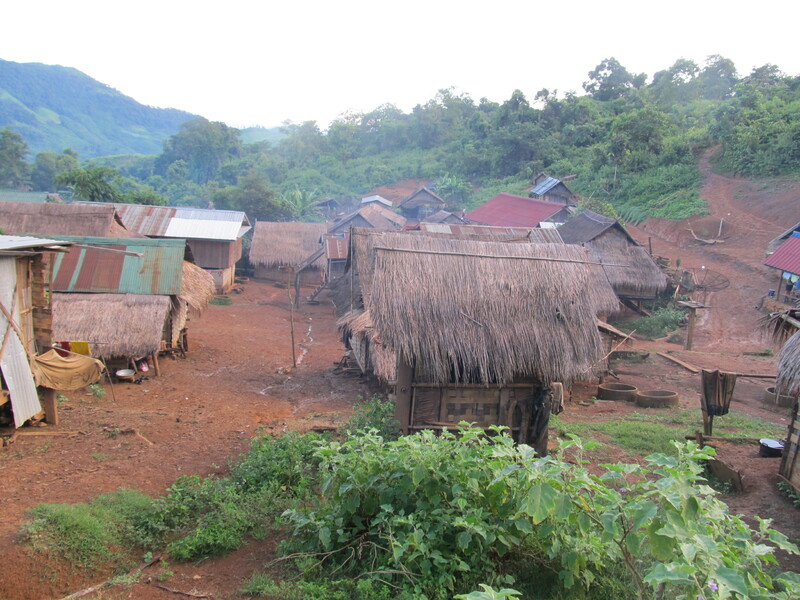 We reached the first Hmong tribal village mid-afternoon, wet and tired. On arrival a particularly large, fierce turkey tried to attack us which woke us up a little. Pigs and piglets were roaming freely, and the villagers crowded around trying to sell us handmade bracelets and just to stare. I get the feeling they don’t see many foreigners up there. The Hmong tribe, nicknamed the Werewolf People, have a few strange customs involving arranged marriages and dowries. We noticed there were a lot more male children than female and this gave us an uneasy feeling. An elderly gentlemen took great pleasure in comparing his watch with mine – although his was actually just a battered dial held on to his wrist by a piece of a string. He also got excited when I took out my mac-in-a-pack and showed him how it folded up into its own pocket. Oh yes, by this point in the day it was raining, obviously. Raining hard. Our home for the night. Again we set off for our bed for the night. This village was surrounded by lush green mountains and we immediately knew all the hard work had been worth it. 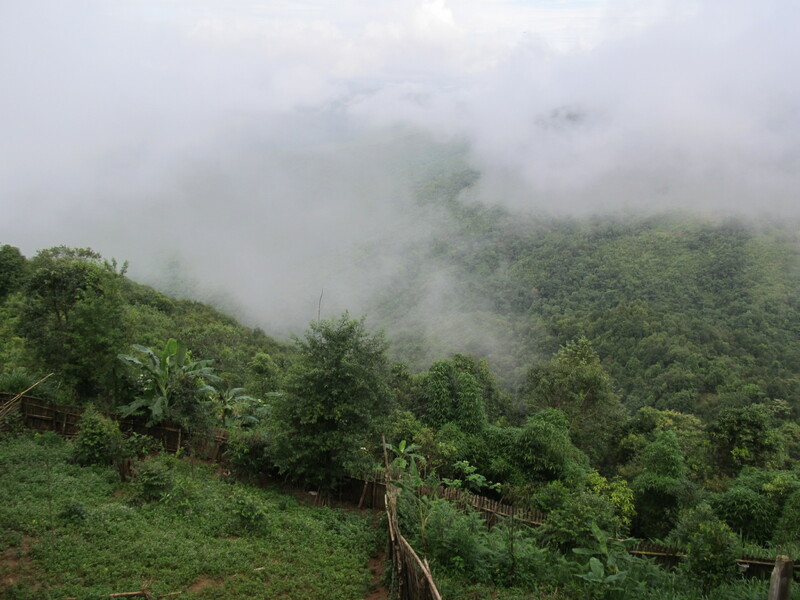 Two tribes lived alongside each other here – the Hmong and the Kamu. The main differences are in their dress and how they build their houses. The Hmong go for bungalows and have no windows in their abodes, whereas the Kamu will build houses on stilts. Our bamboo hut was a welcome sight, and we immediately got rid of our wet gear, trying not to think about the reality of wearing our soaking boots the following day. Our guide suggested we use the locals’ shower to clean off before dinner. This ‘shower’ was actually one tap with a tiny wall about a foot high around it. In other words: a communal washroom with zero privacy. We donned our bikinis and took a bar of soap down to the tap, queuing behind ladies filling buckets and washing clothes. Eventually we managed to get a quick scrub down – very welcome after the day we’d had. I slept surprisingly well on the floor of the hut. I was extremely glad of the mosquito net after my torch revealed the biggest spider I’d ever seen casually hanging out in the corner of our room. By this point I was too exhausted to care, though, and fell asleep hoping I wouldn’t wake with a spider on my face. The next morning the rain was back. It was as if we were inside a cloud up there in the mountains. There was no choice but to strike out and deal with it, so down we crept that morning trying our best not to lose our footing. It was a hard-going couple of days trekking in northern Laos, but it was definitely my highlight of this amazing country. Finally, I had managed the seemingly impossible. I’d got totally away from all the tourists and had a taste of the ‘real’ Laos – the beautiful countryside, the age-old tribes which haven’t changed for hundreds of years, the harsh reality of the weather. Each place I visited in Laos was memorable and unique: the chilled out quiet of Don Det, the wild empty hedonism of Vang Vieng, and the sheer beauty and magnitude of Luang Prabang and its surroundings.